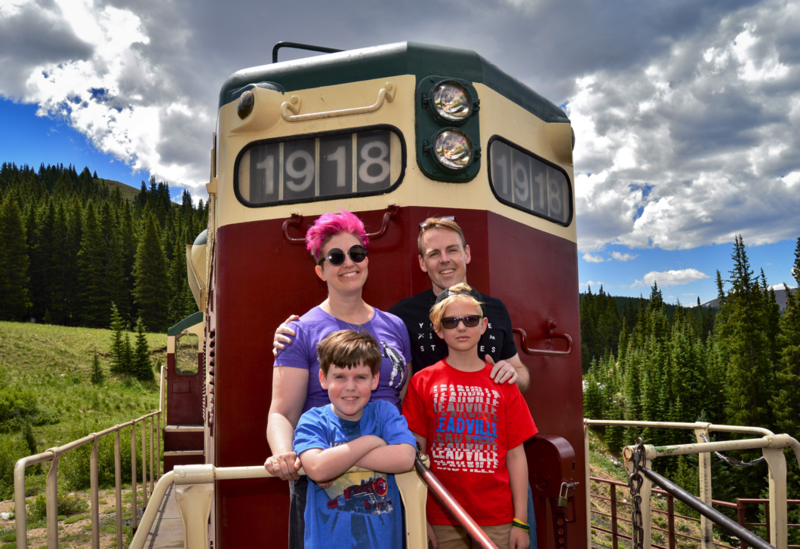 We’ve taken the boys on the Leadville & Colorado Southern scenic railroad a number of times since they were teeny. This year’s ride was more special than the rest. Grandpa Liggett treated each guy to a trip that included riding in the caboose and in the engine! Needless to say, Henry was beside himself with excitement, and Finn was pretty jazzed, too. The engine pushes the train up the mountains from behind, so the caboose is in the lead on the way up. The boys loved sitting high in the cupola and enjoyed the 360-degree scenic view from the top. The brakeman, Jason, let us ride on the outer deck of the caboose and take in the scenery from there. When the train made a brief stop at the top, Henry hopped off solo (against the advice of the brakeman) in hopes of finding a stray railroad spike. Just as Henry found one and put his foot back on the step of the caboose, the horn blew and the train started rolling again! On the way back down to the depot all four of us sat in the huge diesel engine and chatted extensively with the railroad owner & engineer, Derek, who’s been manning the controls since he was a teenager (supervised by his own dad back in the day). All in all the day was a blast, and one we hope will provide some happy core memories for both guys.